If you're parading around the city as a crusader of the night, you will most assuredly need some handy-dandy way to keep all of your fancy high-tech tools nearby! The baterangs, the smoke bombs, the decoders, listening bugs, and grappling hooks! And you can't run around the city with a purse! How impractical is that? No, you'll need something a little more functional than that, and you wouldn't be a proper vigilante if it didn't at least match. Viola! 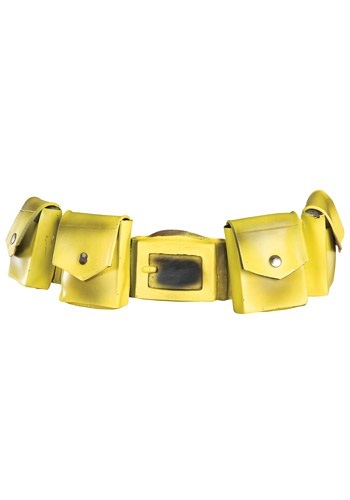 Here we have a Yellow Batman Utility Belt for your classic Dark Knight costume! It's made of rubber, includes four pockets, a foam boomerang, and fits waists 27-37". Now that you're equipped, go be the defender of of the night we all know and love.